I have joined a Celtic fusion band on drum machine - oh what fun, and an electro folk band on saxophone - also a great gig. Suddenly my agenda is being filled with dates, paid work and good times. At the end of July I'm going to Hull Folk Festival to play drum machine with Aartwork, a Celtic Fusion band. I hope the trad folkies don't lynch me! In August I'm blowing my heart out with Mista Beat at Maui Waui Festival. In the meantime I have some ambient techno, solo gigs, actually where my heart is (girl in a gale core work), a constantly evolving set of tracks made in the moment with techno grooves and sonics out of my suitcase of analogue synths (The Smokehouse, Ipswich, supporting Slow Down Missy 19th July) (The Table Restaurant, Woodbridge part of DJ David Freeland's Soul Food Sundays 22nd July 2018). Festivals are fun, the sub-bass of various stages clashing with sounds, straw hats and cheerful consumers enjoying the performances. 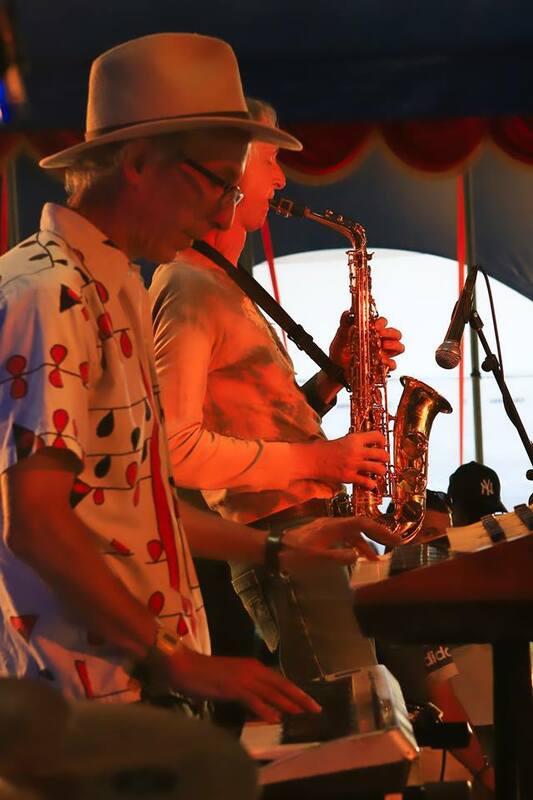 Here's a photo by Jerry Tye from Norwich Chapelfield Gardens festival of me playing saxophone with Mista Beats.